The moment is finally here! You can now Jailbreak your iPhone, iPod Touch, iPad untethered on the iOS 5.1.1 firmware with Absinthe 2.0. Pod2G and numerous other hackers have worked hard to bring you this iOS 5.1.1 Untethered Jailbreaking solution, so don’t forget to donate if you can. If you are looking for a how to guide on how to Jailbreak your iPhone 4S, iPhone 4, iPhone 3GS, iPod Touch 4G, iPod Touch 3G, The New iPad (iPad 3), iPad 2 and iPad 1 on the iOS 5.1.1 firmware untethered then you are in luck. In this how to guide you will learn how to Jailbreak your A5 or A4 iPhone, iPad, iPod Touch running the iOS 5.1.1 firmware Untethered using the Mac OS X version of Absinthe 2.0. Note: The Windows version of Absinthe is similar in jailbreaking steps. Perquisites: The first thing you need to do before starting this how to is make sure your iPhone, iPad, iPod Touch is backed up. As the Absinthe Jailbreaking tool was just released, there is a good chance that you may experience an error Jailbreaking it. Thus, it is always a good idea to make sure all your content on your iPhone, iPad, iPod Touch is backed up. Recommendation: It is our personal recommendation and Pod2G’s that you restore your iPhone. iPod Touch, iPad to factory settings on the iOS 5.1.1 firmware. This will dramatically reduce the chance you have of experiencing an error while Jailbreaking it. This is your call however, and is not necessary 90% of the time. Step 1) – First things first. You will need to download the latest version of Absinthe 2.0 from the iJailbreak Downloads Section or from the direct download link below. It is always recommend that you check the iJailbreak Download Section, however, to ensure that you are downloading the latest version (we do not always update these guides with the up-to-date versions). Step 2) – With Absinthe 2.0 downloaded you will need to launch the Absinthe Jailbreaking tool, from the directory you downloaded it to (by clicking the Absinthe app shortcut). 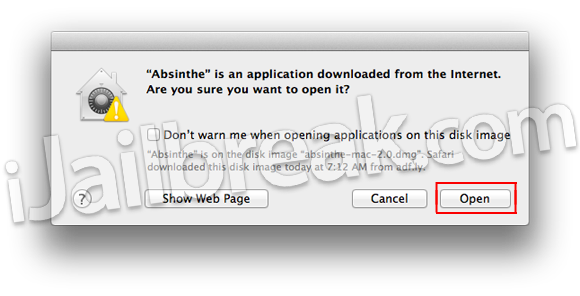 Note: If you get a message asking you whether or not you want to open “Absinthe” as it is a downloaded application, click the Open button. Step 3) – Once Absinthe is running you will need to plug your iPhone, iPod Touch, iPad into your computer (if you have not done this already). Upon doing this Absinthe should recognize your iPhone, iPod Touch, iPad, and once this happens you will need to click the Jailbreak button in the middle-right side of the screen. Note: The Jailbreaking process can take anywhere from 5-minutes to 10-minutes so be patient. If you have not restored your iPhone, iPod Touch, iPad then it could take much longer depending on the amount of content on your iPhone, iPod Touch, iPad. Step 4) – Once your iPhone, iPod Touch, iPad reboots you can slide-to-unlock it and then on your SpringBoard (homescreen) you should notice Cydia. Tap on the Cydia icon and let it prepare its filesystem. Congrats! You have just Jailbroken your iPhone, iPod Touch, iPad Untethered running the iOS 5.1.1 firmware with Absinthe 2.0. Hopefully this how to guide has helped you Jailbreak your iPhone, iPod Touch, iPad running the iOS 5.1.1 firmware using Absinthe 2.0 on Mac OS X/Windows. If you have any questions or thoughts related to this tutorial please leave them in the comments section. It doesn’t work. There’s no Cydia icon. Not working on 4s.. Tried it in Lion & Snow Leopard.. no go..
worked after trying 2 times! Does it work on iPhone 3GS new bootrom??? For me it also doesnt show any Cydia Icon. My iphone is unjailbroken 4s 5.1.1 . what should i do? Me to when I go to extract the files it says it can’t extract them with the encryption then I go and run the jailbreak everything goes thru but at the end it says to try again unplug your device…. If you get stuck at the step that says “Waiting for iPhone to reboot, don’t unplug your device,” then just reboot it yourself by holding down the home button and the power button until your screen goes black, and the apple appears on your screen! iPhone 4S Verizon no cydia after jailbreak without errors. i have iPhone 4s ios 5.1.1 windows 7 and i downloaded absinthe v2.0 and worked great but didn’t install cydia ?? I notice that it is always “Searching…” for the AT&T network and I always have to manually slide to unlock it and then it eventually displays AT&T 4G with full bars. I did two backups (one in iCloud, one via iTunes) and before each JB attempt, I always do a “Reset and Erase all Settings an Content”, which wipes the iPhone clean, so I’m not sure how this has to do with a restore??? It’s an “activation” issue, per Absinth 2.0. Anyone get this Activation problem? You just upgrade to iOS 5.1.1 via iTunes or via the iPhone and then re-jailbreak. Abisnth will not recognize your device until it’s on iOS 5.1.1. Absinthe 2.0 or 2.0.1 for jailbreaking iphone 4S 5.1.1? Exact same issue here. I don’t know what I’m doing wrong! Any help appreciated! I did this with a phone a had a tethered unlock with, by restoring and updating to 5.1.1., and now the phone isn’t activated so it won’t let me jailbreak it. Am I totally screwed here? hi guys! please help me, mine is a bit serious…i dont know what to do and i’m pissed now. i am using windows 7 both for SAMSUNG R440 and ACER ASPIRE 5570. i tried downloading the ABSINTHE 2.0.1 and everything seems to be fine from downloading the zip file to extracting the files. after extracting the file i can see the absinthe logo, macosx & read me, tried opening absinthe it says publisher could not be verified are you sure you want to run it? i clicked RUN. es / o / lways / kip all / uto rename all / uit? THERE. THAT ENDS IT. TRIED MORE THAN 10 TIMES. STILL THE SAME IN MY TWO LAPTOPS. I have an iphone 3g, iphone4, ipad 1 and ipad 2 wifi. and this makes me really upset. by the way, i was able to jailbreak my iphone 4 before untethered directly on my my device with jailbreakme, i jailbroken my ipad 1 tethered running 5.1 using redsnow so i wonder why i cant make it work this time? Always go with the latest version of ANY app. You guys are legends, worked first time. i just did it and everything is fine except my stock, phone, music and reminders icon are blank but i can click the and they work. anyone know why? or how i can fix this? nevermind, hitting the cydia app and letting it prepare its filesystem fixed it. works 100%!!!!! thank you!!!! Right after awhile and with the release of Absinthe 2.0.1, I did the jailbreak again. This time I got the lockdown error, but it did install cydia. Although when I opened cydia some of the sources were missing. I then reinstalled cydia from packages within cydia, I had to do this several times. It now works with out fault, had it running and installing alsorts for the last few days without a hitch. Love it. Hope this helps others with the same problem. I jailbroke my iPhone 4S with Absinthe 2.0 and after getting on Cydia, I lost all Apple/iPhone apps; inlcuding messages, phone, calcultor, etc. error message “the attached device is not activated…” but my phone islocked what should i do? why my iPhone 3gs doesn’t have cydia? PLS I NEED YOUR HELP! a friend of mine gave me an iphone 4 yesterday. the iphone has a baseband of 04.11.08 and it is running on ios 5.0.1(jailbroken but not unlocked). pls i want you to help me out in upgrading it to ios 5.1.1 and to be able to unlock it. i have searched for tips on the internet on how to do it but to no avail. I have a 4s that I jailbroke with absinthe for os 5.0 I am confused what to do now.. when I try to update to os 5.1.1 its erroring out.. If I have to restore, will all of my “tweeking” be gone when I update and re-jailbreak? What you ask is impossible. Are you saying I should forget about the phone? worked great for me all you have to do is download the new version and jailbreak i love you! Turn your phone off then on again and cydia will be there lol happy jailbreaking!!! i have a iphone 4 with ios5.1.1 running the jailbreak through vista and absinthe will not recognize my device so the jailbreak button does not light up.. help??? absinthe didnt recognize my iphone what should i do? do iphone 3g support this 5.1.1? I completed the process and cydia was installed but it says none of the packages are installed. I don’t know what to do. is there anything I can do to activate my Iphone4s i tried jailbreaking it with absinthe all I’ve get is ” the Attached device is not activated” i thought jailbraking it would be the solution….. Any body out there have an idea? 1. Remember in order to jailbreak your iphone you have to have the 5.1.1 software on your phone. 2. if you do not, you will have to reset your phone to the 5.1.1 software. if you have the 6.0 software the jailbreak software will not work. 3. you have to wait for the jailbreak software to update to its new version. Trying to jailbreak my iPad 1 with Absinthe following instructions but the device is not connecting even though it is connecting to my windows 8.1 , How can I get Absinthe to recognize it ?